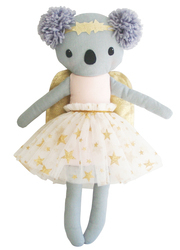 A sweet baby koala angel 25cm. featuring soft pink bodice with soft ivory and gold star tulle tutu and sparky gold wings. Suitable from 3yrs.